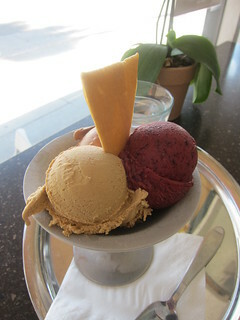 My Vienna invokes an Austrian gelato cafe in the middle of Beverly Hills. Austrian former pro-tennis player Spin Mylnarik learnt the ropes of gelato making from a master in Austria for his wife, who loved the gelato she had in Europe. Don't you also want a hot pro-athlete to learn how to make gelato and open up a cafe for you? Here, you won't sit down with your gelato in paper cups. The gelato is properly served in tin cups with a glass of water. All paper cups are strictly for to-go orders only - that is, you'd have to leave the premises with it. 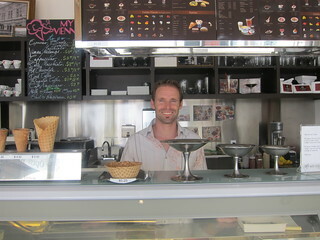 He aspires to the cafes in Europe where people spend time sitting down and enjoying their gelato. 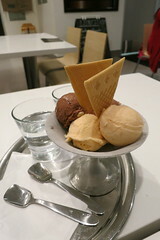 The gelato itself is excellent. The Nocchilone (chocolate hazelnut) is a bestseller here, and the European Cookies flavor is the staff favorite. I also like the fruit sorbets, especially the cantaloupe. In fact, I thought the gelato was so good that I had to get a whole styrofoam container to go (you can get 4 flavors to go for $14). 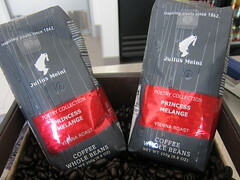 The coffee and teas served here are strictly Austrian. 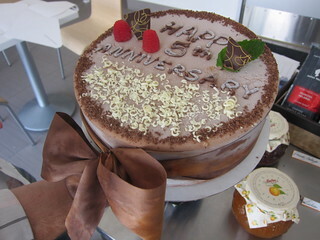 Sacher Torte and Austrian pastries are made in-house, and gelato cakes are available with special order. During lunch you can get salad, sandwich, and a small gelato for $10.95. There's a lot of metered parking in the back (which is free after 6pm).